La Donna Harris is a nationally recognized leader among such notable organizations as the National Congress of American Indians, Smithsonian’s National Museum of the American Indian, and the National Organization of Women. As a national Civil Rights leader, Harris has served U.S. Presidents since Lyndon B. Johnson, with appointments in the Nixon, Ford, Carter and Clinton administrations. Harris is one of the very first Native women to step forward and address the severe economic and social ills plaguing Native American people in Oklahoma. An Oklahoma resident for over ninety years, Thelma Parks has spent her personal and professional life enhancing the lives of others as a dedicated educator, community leader, creative organizer, and philanthropist. She has been a consistent and outspoken advocate for civil rights, human rights and equal rights. In 1987, she won the District 5 seat on the Oklahoma City Public Schools Board of Education, serving over 24 years. 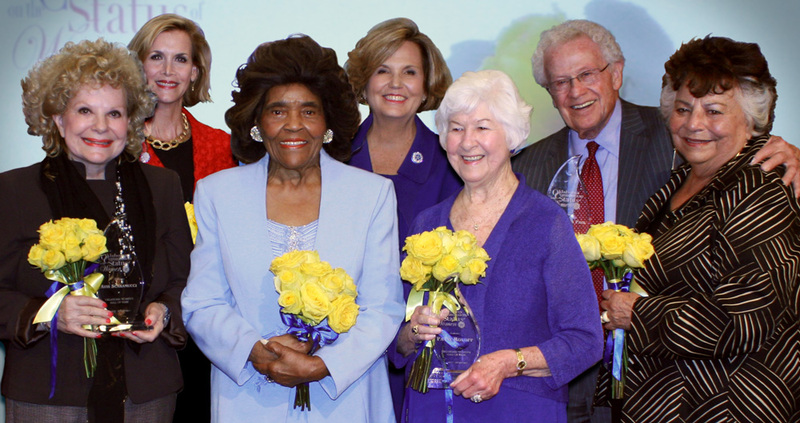 In recognition of her service, the Thelma Reece Elementary School was named in her honor. Born in Kansas, Patty Roloff has lived in Oklahoma since she was three years old. Always at the forefront as a woman in a man’s world, Roloff was instrumental in keeping professional sports in Oklahoma City. In 1978, when the 89’ers were considering leaving Oklahoma, Roloff bought the club. She owned the club for eleven years, retiring the franchise in 1989. Roloff’s leadership kept professional baseball active in Oklahoma City, leading to the Oklahoma Redhawks and, now, the Oklahoma City Dodgers. Avis Scaramucci has been recognized statewide and nationally as an entrepreneur. She began in 1991 with a gift boutique, The Painted Door, in south Oklahoma City. In 2005, Scaramucci opened Nonna’s, which closed in 2104, and The Painted Door in the heart of the Bricktown district in Oklahoma City. This business venture was featured in numerous news and magazine reports, including Southern Living, Women’s Wear Daily, and the Food Network. Scaramucci also own and operate Cedar Springs Farms, an extensive greenhouse operation which provided fresh produce for Scaramucci’s restaurants year-round. Mary Mélon has spent her professional and personal life working to benefit Oklahomans, particularly its women and children. Currently, Mélon is President/CEO of The Foundation for Oklahoma City Public Schools. Prior to joining the Foundation, Mélon had a nearly 20 -year career at The Journal Record Publishing Co., where she conceived and implemented the Journal Record’s Woman of the Year program. This annual event names a Woman of the Year, and also recognizes fifty women making a difference to the state every year. Dr. Marion Paden, Vice President for Enrollment and Student Services at Oklahoma City Community College, is recognized for her accomplishments in the area of education. She designed and implemented innovative student success programs and services at colleges and universities in Oklahoma and Texas. She is Oklahoma’s longest serving chief student affairs officer at Oklahoma’s 4th largest higher education institution, where the majority (62%) of students are female.